Can anyone provide a working example of the get_market_history CLI command please? I've been unable to provide the command valid input data, I keep getting error messages about ISO time formatting (despite attempting to use such formatting). I'm wanting to dump the market history for the MPA/BTS trading pairs & summarize market making participation using Hadoop, potentially incentivizing market making activity (filled orders only, select trading pairs). Side note: I think it'd be a great idea to provide a single working usage example for each documented API command, this would significantly improve the ease of learning the CLI commands. General Discussion / Bitshares UI Customization Guide! Fuzzy contacted me on Telegram regarding the potential development of customized web wallets, so I created a draft guide regarding how to customize the Bitshares UI. The aim of this guide is to provide a fast on-ramp for new UI developers. The guide covers the dev environment setup, editing the header/footer, changing the featured trading pairs throughout the UI and how to create new themes. General Discussion / CFETS MPA? Do you think there would be interest in an MPA based on CFETS? Hertz is a highly experimental Market Pegged Asset (MPA) created on the Bitshares network. Elected Bitshares witnesses will publish price feeds which are pegged against the United States Dollar (USD) and predictably oscillates using a sine wave algorithm. The sine wave has an amplitude of 14% and a period of 28 days, thus the price feed value changes 2% every day and a resulting max price feed value of $1.14 and min of $0.86 (Note: Depending on the combination of Bitshares price volatility and age of price feeds published by witnesses, these limits may not always hold). Hertz tokens are shorted (borrowed) into existence by users on the Bitshares network with at least 175% backing collateral in Bitshares; there is no centralized issuance and asset creator permissions have been restricted for increased decentralization. By implementing a sine wave phase offset (date/time), we are able to make each Wednesday (mid working week) the most important day for Hertz. hertz_calculator.xlsx : A spreadsheet for evaluating the effect of different sine wave variables (amplitude, period, etc). hertz-verification.py : Used for verifying that the phase offset lines up appropriately. hertz-feed.py : What you'd use if you don't use wackou or xeroc's price feed scripts. Wackou's 'BTS_Tools' (Only use if pull request #36 is merged, OR if you change 1/3 to 0.14 yourself manually). "BitShares has a new formula pegged asset (FPA) or dreamcoin called the "HERO" that is mathematically defined to appreciate annually by 5%." Launch_Block_Number = Block number close to 'go-live' launch of token. This would create an incentive to lend the token into existence and sell it at the feed price, as when the token decreases in value the debt will be lower. Where the HERO asset creates an incentive for buying the token, this would be an incentive to sell it. Likewise, the switch to reducing the feed price every day provides a faster opportunity for lenders to buy back their debt at a decreased price (as BTS could be fluctuating heavily). Please do post, I'd love to hear your thoughts. Have an idea for an alternative Formula Backed Asset? I'd love to hear them! Got a better name than 'Arch Nemesis'? Would you trade HERO against Arch Nemesis? What would be an appropriate reduction_modifier? The CryptoFresh block explorer is notorious for going down, and it's currently our only web block explorer which many services rely upon. I believe that users have reached out to the owner of CryptoFresh unsuccessfully requesting the open-sourcing of his explorer in return for a payment/worker-proposal (despite his requests for witness votes to fund the website), so I think it's a good idea that we try to lure new developers to this task. I understand that anyone can create a worker proposal to request payment for work, but it appears that only long term community members have had the confidence to create worker proposals. Perhaps it would be worth creating a public bounty which upon the delivery of an open source block explorer is paid out? If there was an open source block explorer, I'd run my own Gridcoin themed Bitshares block explorer & I'd imagine that many others would run their own explorer. What should be the minimum requirements of such a block explorer? What would be a fair bounty for such a task? General Discussion / Lets bring " earn x% interest on 'anything' " back to Bitshares! One of the major selling points of BTSX for me back in 2014 was the 5% (or x%) on 'anything' marketing (that and sharedrop theory). The idea that I could store MPAs/UIA in effectively my own bank and get better interest rates than that FIAT banks were offering was a powerful message that had me (and a lot of other users) sold. I realise that in the migration from BTSX (BTS 0.x) to BTS 2.0 we removed 'socialized yield', however I believe that the removal of profit sharing though asset fee yields was a mistake. The following quotes are from the above link. 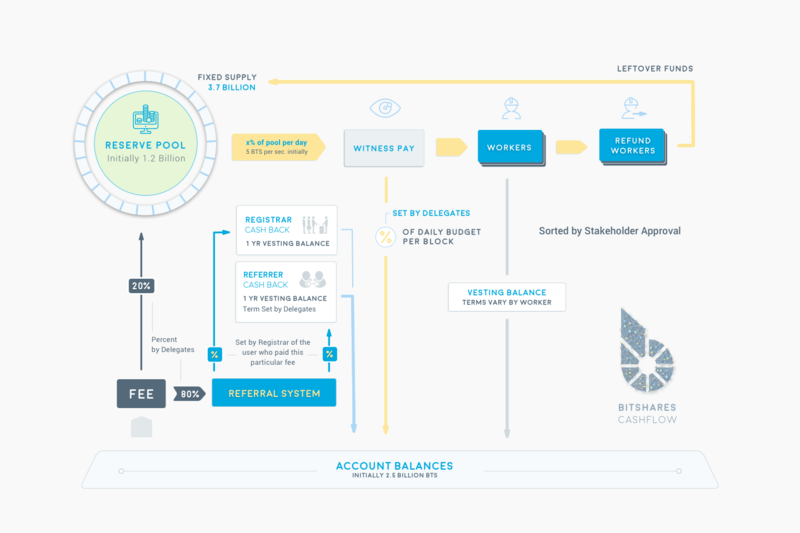 Under BitShares the BitAsset holders receive a yield simply by holding BitUSD. This yield was between 1% and 5% APR on average. Unfortunately, yield harvesting can happen at any time by someone shorting to themselves to gain a very low risk return and undermining goal of encouraging people to buy and hold BitUSD. The yield was funded from transaction fees and by interest paid by shorts. The funding of yield through fees was successful despite the fluctuating rates (1 - 5% APR AVG). The issue was that users were able to 'yield harvest' by shorting to an alt account, effectively cheating the system. An alternative distribution mechanism to paying interest by shorting is required. Peerplays has the ability to distribute 'dividends' to users that hold the peerplays tokens, we should be doing something similar for tokens on the BTS DEX. Hopefully peerplays dividend/profit-sharing code is somewhat compatible with Bitshares (it's using graphene after all). As we stated previously, undercharging for transactions is bad for business and BitShares was effectively earning nothing for all transactions of BitUSD because 100% of the income generated from fees was paid out to BitUSD holders as yield and nothing was left over to cover network expenses. We now gather 20% of fees into the reserve pool (which also contains over 1 Billion BTS), which goes towards workers and witnesses. 80% of fees go towards the referral system. I would propose that we re-evaluate the distribution of fees between the reserve pool, referral system and asset holders. We could burn through a chunk of the reserve pool, but this would be temporary as we would eventually need to reintroduce such fees to build the reserve pool back up. I think it's most fair to take a chunk of the fees from the referral system. While Socialized Yield is broken, BitShares 2.0 offers a far better alternative: Collateralized Bonds. Collateralized Bonds enable arbitrary shorting between any two assets, guaranteed interest, and no risk of being force settled. This system privatizes the yield to individual bonds and the terms and leverage available can be far more flexible. In effect, BitUSD becomes cash and a Bond becomes a Certificate of Deposit. The concept of "Collateralized Bonds" did not make it into Bitshares 2.0, so in effect we cut asset holders out of fee redistribution without providing a replacement source of income for holding assets on the Bitshares DEX. I believe this may be a reason why we had a downtrend when switching from 0.x to 2.0 (disregarding merge drama). General Discussion / Bitshares BOINC project brainstorming thread! All ideas welcome! I have been paying attention to the recent Bitshares testnet stress-testing https://bitsharestalk.org/index.php/topic,23829.0.html which yielded a rate of approx 3k TX/s, it was mentioned in the 13th Bitshares hangout https://soundcloud.com/beyond-bitcoin-hangouts/bitshares-hangout-13-w-christoph-hering-fuzzy that a potential reason that we were limited to 3k TX/s was the lack of computing power at the disposal of the stress-test organizers - I believe that the BOINC & Gridcoin community can help! BOINC https://boinc.berkeley.edu/ is an open-source kit for volunteer distributed computing, it can distribute any kind of computing task and has between 250k & 560k active users (differing estimates depending on what site you go to.. it's difficult to guesstimate) & 4 million registered users in total. To put the scale of available computing power in perspective, team Gridcoin has 100k hosts at its disposal and currently only rewards 0.5% of the active BOINC community. The majority of the BOINC community contributes their resources entirely for free, those that crunch under team Gridcoin are rewarded GRC by the network on behalf of whitelisted projects (project owners pay nothing). I spoke during episode 200 of the BeyondBitcoin hangout https://soundcloud.com/beyond-bitcoin-hangouts/beyondbitcoin-spotlight-gridcoin-03-24-17 and the 14th Bitshares hangout Chris4210[/member]/bitshares-hangout-14-03-31-17]https://steemit.com/bitshares/[member=38926]Chris4210[/member]/bitshares-hangout-14-03-31-17 on this topic. It was mentioned in the last Bitshares hangout that the Bitshares testnet stress test may have been limited due to a lack of resources available for creating a larger transaction volume - what about distributing testnet load generating software out to a few thousand computers around the world via a BOINC project? Such a project wouldn't be eligible for Gridcoin whitelist status (no GRC rewards) due to the bursty nature of stress testing (GRC needs continuous work availability). You could easily distribute an UIA to your volunteers proportionally to their completed work by adding a Bitshares field to the BOINC signup page and user profile. I'd imagine that for this idea, you would distribute a docker container which contained python dependencies, the testnet stress-test python script, and the bitshares client. Once running on an user's machine, it would need to create a testnet user account, the project admin would send enough testnet BTS to each volunteer bitshares account, each account would register as lifetime (for less fees, but not neccessary), then the main stress-test script would begin bombarding testnet with transactions. The 3000+ TX/s rate achieved in the recent Bitshares testnet stress-test was great, but let's try to push it to 1 million + TX/s! Alongside the testnet load generator, you could distribute full node servers out to volunteers to supply additional network resources to the Bitshares network. This would require the development of a proof-of-bandwidth credit mechanism (how to reward credit to users based on their full node availability/capacity/consumed-resources). This would require setting minimum computer spec requirements, so not everyone would be able to participate unlike the load generator. We currently have ~25 witnesses, down from 100 in the switch from BTS 1.0 to BTS 2.0, we could experiment with different quantities of witnesses in an automated manner to evaluate optimal quantities of witnesses. The BOINC web server is programmed in PHP, you can easily add a Bitshares (and bitshares testnet) account field to the account signup page (and profile page), then expose said account name within the user statistics xml files (which is generated every 24hrs) then you can proportionally distribute an UIA on the BTS network to each BOINC volunteer proportionally to their contributed computation (RAC). Since these xml files are public, anyone could distribute their own UIA against your volunteers (new sharedrop vector!). If there is a continuous availability of work units for volunteers, then the project would be eligible for Gridcoin whitelist status (the Gridcoin network would distribute rewards to your volunteers). Do you have an idea for Bitshares which requires vast amount of distributed computing power? Please post your ideas in this thread! General Discussion / Gridcoin's BTS Web Wallet Customisations! The Gridcoin community has begun customizing the Bitshares web wallet, prioritizing OPEN.GRC as a featured asset & main trading pair against many important BTS assets! It only took a day of editing (and a day of messing with the build environment) to get this far. It's not a live wallet for the public, but still in development & open-source for anyone to run locally. I might create a guide for setting up a similar build environment using Windows and Virtualbox if anyone's interested? I hope to add in new drop-down menus to the right of 'Deposit/Withdraw', linking to the other web wallets (OpenLedger, FreedomLedger, BTSABC, etc) and to BOINC/BTS/Gridcoin community links. The *.JSX is a tad confusing though.. Some of the screenshots still show Open.BTC being used as the trading pair, this has been changed. General Discussion / Gridcoin community discussing potentially utilising Graphene to scale massively! Back when the Gridcoin community was looking for a safe haven away from emerging Scrypt ASICS (when GRC was Scrypt POW based), I proposed that we should have switched to using DPOS (back in December 2014!). Gridcoin ended up picking Blackcoin's POSv2 mechanism instead of Bitshares' DPOS mechanism, but I've begun restarting the discussion over at cryptocointalk. We're needing to scale from 2k users to 560k+ users, our main scalability issue is the neural network - currently each windows user gathers user XML files (some 1-2GB in size) from each whitelisted BOINC project & extracts team gridcoin stats to form the neural network with (to base GRC rewards with). If we were to remove the team requirement, we could quite easily scale to 10's of thousands of users, but if we've got 10k+ (or 100k+) users all downloading these XML files, we'll be effectively DDOS'ing the projects. Several BOINC projects are based at universities or are home servers, not many could withstand this scenario. If we had witnesses, they could gather the statistics to form the neural network instead of all users - drastically reducing the load our system places onto BOINC users. We've been discussing this in the cryptocointalk thread and in the 9th/10th Gridcoin Community Hangouts (currently being edited, not live) - difficulties would lie in ensuring witnesses are providing identical neural network stats (punishing/catching witnesses deviating from legit stats) and in having witnesses pay BOINC users their owed rewards (rather than currently the case where end users are rewarded once they stake a block). I'm open to discussing this in detail & would love to hear your thoughts on this idea. General Discussion / Should the Bitshares committee surrender overreaching MPA permissions? Currently, the 'smartcoin' market pegged assets (MPA) (such as bitUSD, bitEURO, bitCNY, etc) which are managed by the BTS committee have several MPA permissions which are slightly concerning. None of these permissions are currently active, but they have not been surrendered (so a future committee could potentially implement them). I don't see any reason why the committee should maintain these inactive permissions, do you? General Discussion / Raising the quantity of BTS witnesses & the introduction of vote degradation? Should we increase the quantity of BTS witnesses? Should we introduce witness vote degradation? In BTSX we had 101+ witnesses, now we have 27 witnesses in BTS. Currently, witnesses earn approx $200/month. If in the future BTS increases significantly in value these positions will be earning more. The reason why I ask if we should increase the witness count is primarily because of the current witnesses slow reaction to implement price feeds. The witness sub-forum (https://bitsharestalk.org/index.php/board,61.0.html) has become a ghost town (witness channel on steemit isn't populated with BTS witness posts). Witnesses once voted in, unless their node degrades, are unlikely to be replaced by another prospective BTS witness. If we had voting degradation where after 'x' months your placed vote on a witness begins degrading over a period of 'y' months, we would see witnesses who actively campaign potentially becoming witnesses, replacing inactive BTS witnesses. Getting current witnesses to implement price feeds for new MPAs is quite difficult, I have been actively campaigning for witnesses to publish price feeds for the 'GRIDCOIN' MPA (https://bitsharestalk.org/index.php/topic,22733.0.html). After 2.5 months and 3 BeyondBitcoin hangout appearances only 2 witnesses have published price feeds for the GRIDCOIN MPA. New witnesses may be more likely to interact with the BTS community. By introducing voting degradation, we may increase regular participation in the voting system rather than a 'vote once and forget' mindset right now. During episode #173, crypto.prometheus raised the issue of due to the current low network voting participation, perhaps an individual armed with $500k they could vote their own witnesses into power - whilst true, on the other hand if an attacker had significant funds they could likely convince an active witness to sell their account (since they only get $200/month, if someone comes along with $10k+ they may be very tempted to take the offer). Thoughts? No official proposal has been created in the client, just an informal discussion at this point. We're soon to have an OPEN.GRC (Openledger) to act as our bridge/gateway onto the Bitshares DEX! 'Project Rain' is the practice of distributing crypto assets to BOINC users based on their verified BOINC computation; it was initially devised within the Gridcoin network and has been expanded to multiple cryptocurrencies and all BOINC teams through this BOINC project. BOINC (Berkeley Open Infrastructure for Network Computing) is an open-source volunteer oriented computing grid that combines the processing power of all individual users for the purposes of scientific research. Think of Project Rain as a massive new share-dropping vector that doesn't require your end-users to handle their wallet private keys nor require proof of IRL identity. Why would I 'Rain' an UIA upon BOINC users? Similar to 'share dropping', Raining an UIA (or even a small % of the total supply) upon BOINC users both distributes your asset potentially further than an ICO or mining phase and purchases an user base with significant computing power at their disposal (Some BOINC users have thousands of cores and/or hundreds of GPUs). There are approx 500k+ active BOINC users & 4 million+ registered users. There's serious potential to far exceed the scale of distribution that Auroracoin achieved. Can I make a BOINC project? You certainly can, anyone can create a BOINC project (there's no central authority behind BOINC project creation). You could potentially 'rain' an UIA onto your volunteers/workers to encourage further computation or to assign voting weight for project decisions. Currently, 29 cryptocurrencies including Gridcoin, BTS, Peerplays, Heat Ledger & Steem are supported. More cryptocurrencies can be supported before launch if you request soon! I'd love to hear your thoughts on 'Project Rain' and ideas of how you could utilize this functionality. P.S. Attention of BTS witnesses! Technical Support / Unable to set MPA variables lower than 1% via Bitshares-light GUI? I'm running the latest Bitshares light GUI (version 2.0.160813). I'm trying to change my MPA's variables, but the following variables can't go lower than 1%? "PERCENT OFFSET OF FORCED SETTLEMENTS"
"MAX FORCE SETTLE VOLUME (PERCENT OF TOTAL SUPPLY PER HOUR)"
I can't put 0.01 directly into the field, it prevents it, I have to put 0.1 in then put the 0 before the 1 afterwards. If I put 0.01 in, it results in '1', but if I put in 0.005 (0.5%) it results in 0. Is this a glitch in the GUI? Can I get around this via CLI? EDIT: I tried sumitting 0.005 for "PERCENT OFFSET OF FORCED SETTLEMENTS" despite it returning '0' in the confirmation page, and it returned an error "stack: TypeError: Illegal value: 0.5 (not an integer)". Edit: I've misinterpreted the overview/confirmation page. 0.01 resulting in 1 isn't 1% but rather 0.01% so attempting to set 0.005 would have been 0.005%, still interesting the error popped up.